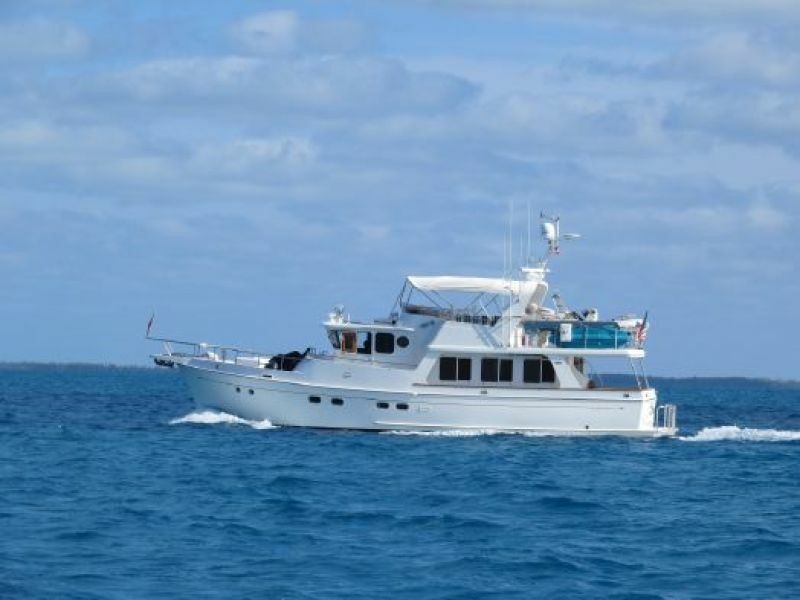 Theodore is a proven ocean trawler, equipped for extended cruising or living aboard from Alaska to Mexico and Bahamas, and Florida to Maine. 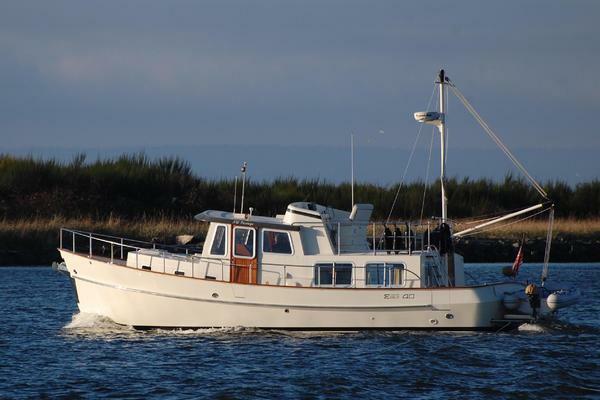 She is a head-turning beautycomprehensively equipped for safe and reliable boating anywhere. 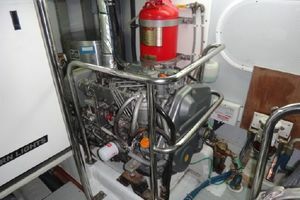 Additionally, she has done the Down East Circle Loop and her air draft is therefore capable of the Great Loop as well.Carefully maintained at all times.A more complete gallery of pictures, CAD drawings of the ship, and detailed description is available on request. 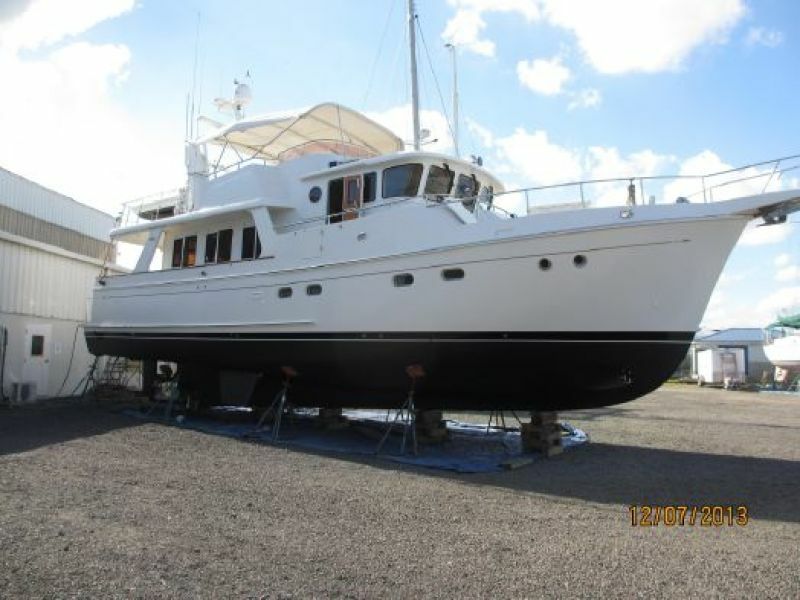 United Yacht Sales New Jersey would love to guide you through a personal showing of this 53' Selene Pilothouse 2005. 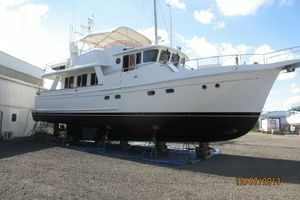 This yacht for sale is located in Maine to Florida 10/18, Maryland and priced at $775,000. For a showing please contact us by filling out the form on this page and we will get back to you shortly! 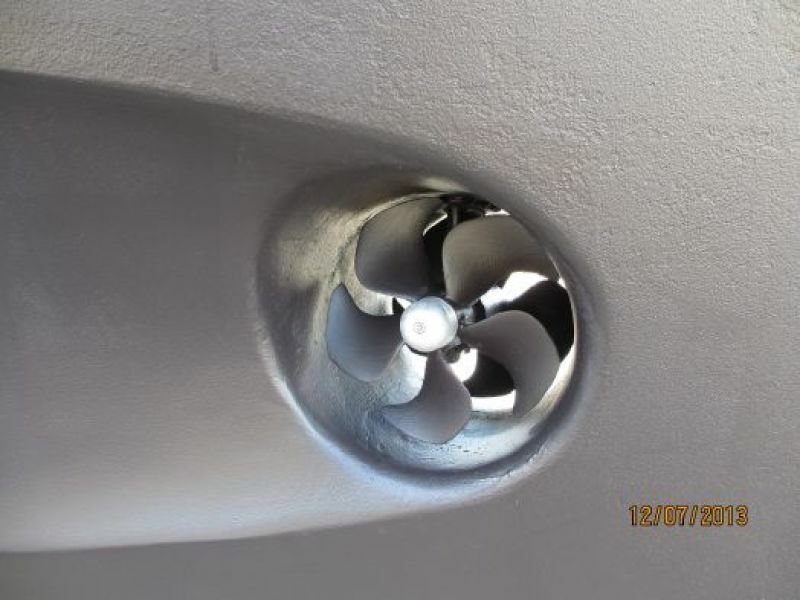 We'll get into details on every aspect of the yacht, but at the risk of being prematurely redundant, consider a few thoughts:In yachts of this class, superior fit and finish, electronics, stabilizers, etc., are rightfully expected. Theodore has all of these and more. 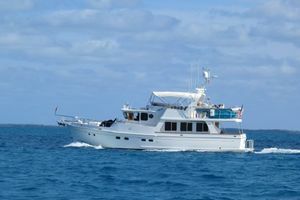 She was designed and equipped to provide themaximum of comfort, safety, boat handling convenience. 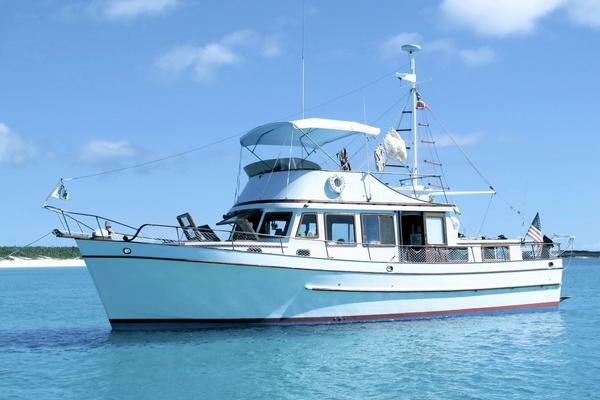 Perfect for the cruising couple, or even a single‐hander.Here are only a few of the reminders of the things a future owner can particularly enjoy, and which in combination distinguish Theodore from most other trawlers in her class:• A unique remote engine/gearbox/rudder/thruster control that can be mounted at fourdifferent forward and aft positions on either side, fore and aft.• Remote hand‐held wireless controller for the Side‐Power thrusters. 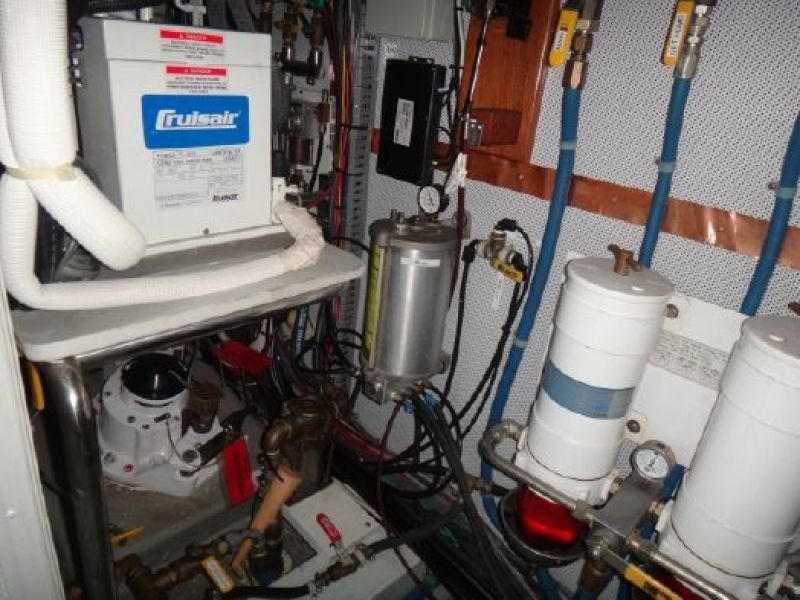 Of great convenienceand help docking, undocking, and tending to the anchor.• 1275 AH of recent AGM batteries to provide electrical loads to sustain normal usage of 120vac for several days at anchor without the use of the genset.• 300‐amp Balmar alternator to efficiently recharge house batteries, even on short legs.• Oversized 9 s.f. 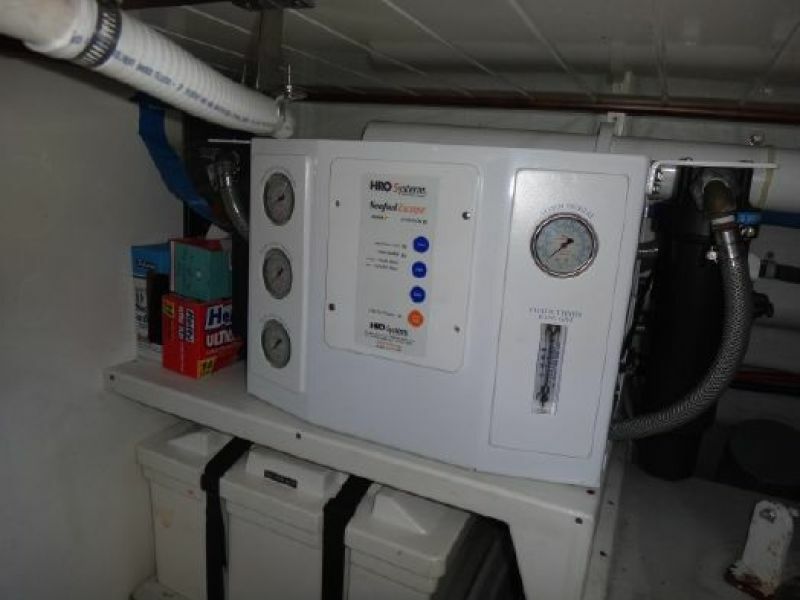 Naiad stabilizers• HRO 600 gpd watermaker• Kabola diesel heater provide silent, even heat throughout. 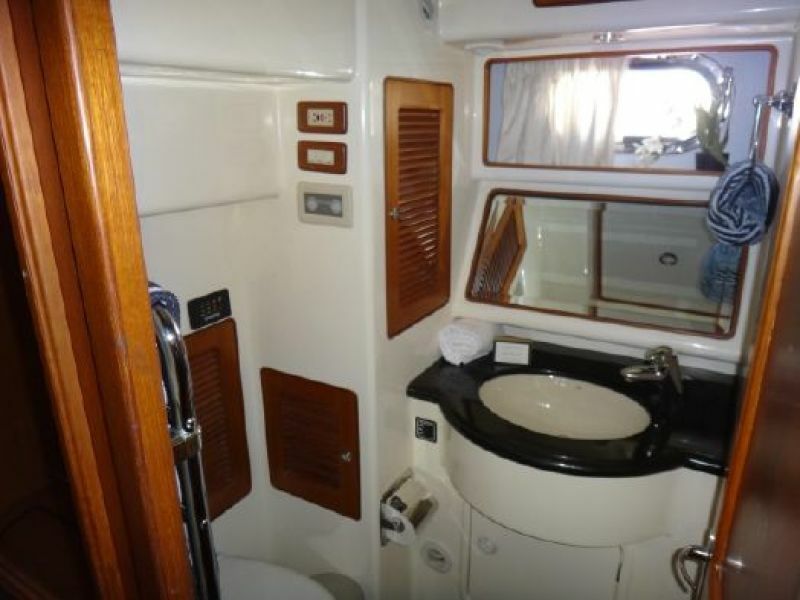 Ideal for extended periods of livingaboard without the need to run the reverse‐cycle Cruisair HVAC system.• Video cameras monitoring the ER and aft.• Fresh bottom paint September 2018.• The third stateroom is a bona‐fide office. For anyone working away from home, this part ofthe yacht might become a deductible expense as a home office.• As with any yacht that includes permanent sleeping, cooking, and sanitary facilities, intereston financing could be deductible as a second home. 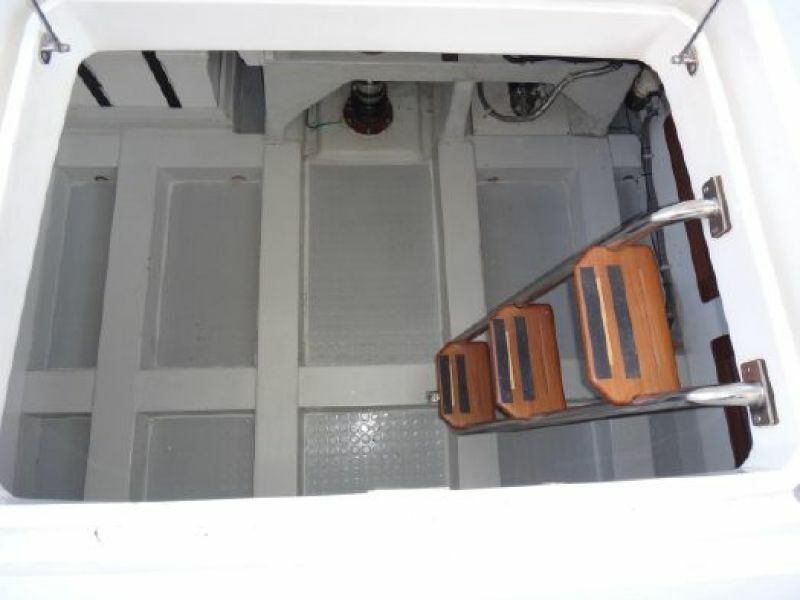 The swim step provides easy access from floating docks. Its four removable “staples” and bulwark handrails give easy of egress throughout the stern cockpit door. 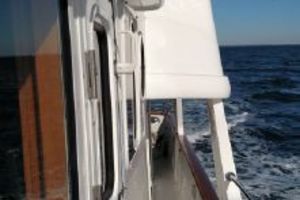 The Cablemaster power cord compartment is located near the starboard side. 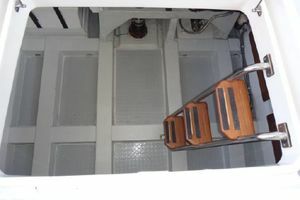 A telescoping swim ladder under a double bolted hatch is located centrally.The cockpit provides an extremely pleasant, year around extension of the salon level when enclosed. 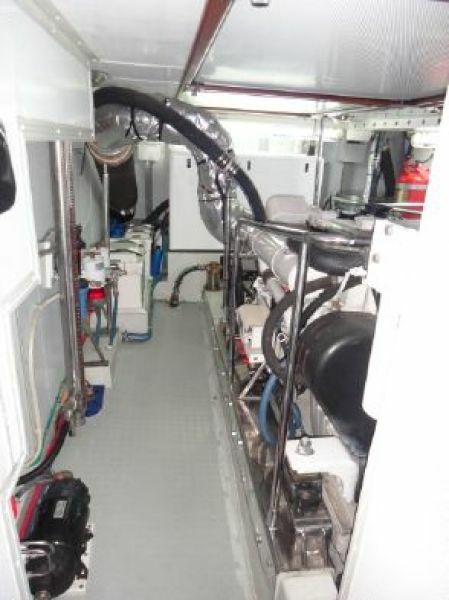 When the clear, EZ2CY Acrylite window enclosures are installed and the spiralstairs covered it is for all practical purposes an additional weather tight room. 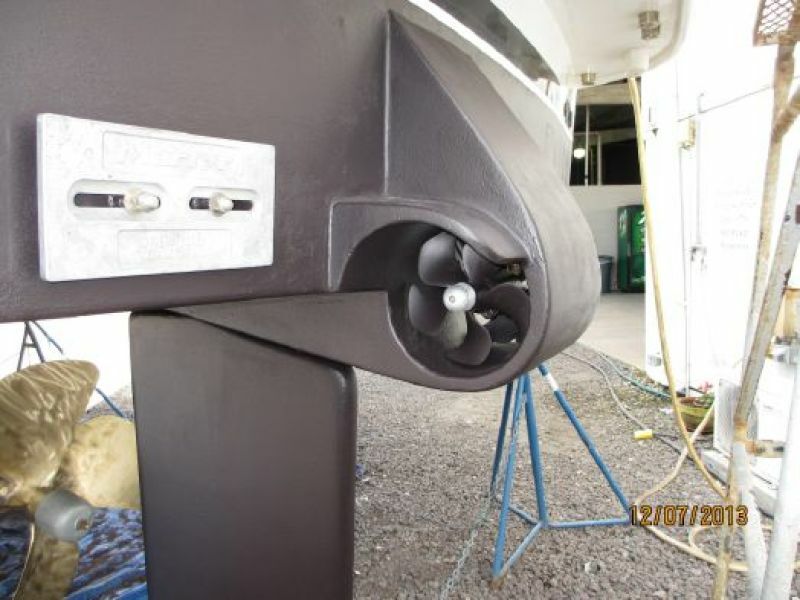 The boat can be docked, or handled when fishing, from the rear by the remote engine, thruster and rudder control. 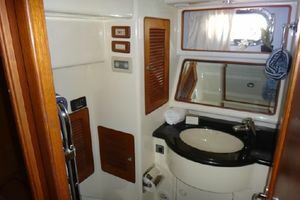 The aft shower is very useful for rinsing off after a swim, cleaning shoes, or dog washing.• In addition to entry from the swim platform the cockpit is entered from port or starboard sidedoors.• There is a spiral stair from the cockpit to the boat deck with white Stamoid cover with zippersthat can be opened from both the cockpit and boat deck sides.• There is a large cabinet under the stair and two smaller cabinets beside the stair.The lowerof the two smaller cabinets has a 110‐volt outlet, and connections for the remote enginecontrols.• There are compartments with a faucet for raw seawater and one for hot and cold fresh waterwith an attached disappearing shower hose on the aft wall.• A large hatch with pneumatic supports provides access the lazarette.• Scuppers with hinged covers and drains are located in the aft corners. The salon is entered through Diamond Sea Glaze dutch door. 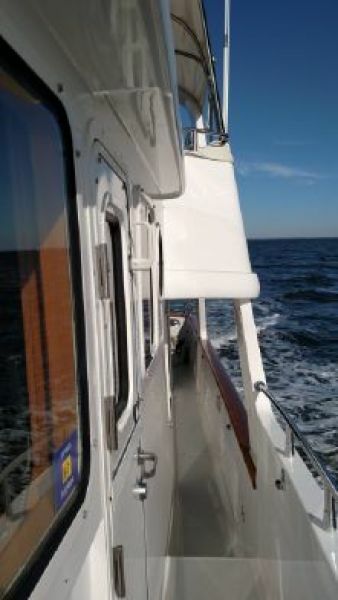 A removable screen on the door provides bug free ventilation along with six, large, screened sliding windows equipped with removable, Lexan storm panels for offshore safety. 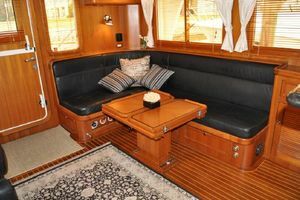 To port is an L‐shaped black leather settee that is convertible to a berth, and has storage underneath and behind the back cushions. 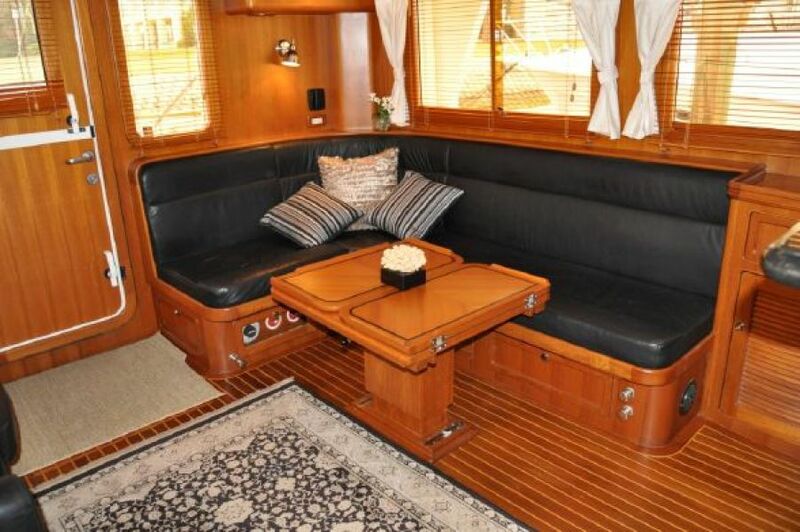 The beautiful teak inlaid table is adjustable for height, expandable for dining and removable if desired. Forward of the settee is a cabinet with Bose Lifestyle 48 entertainment center, and drawer storage. 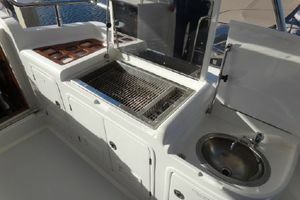 An LG LED 22‐inch flat panel TV is mounted in an enclosable cabinet under the aft side of the galley bar.To starboard are two leather barrel chairs with Ottoman storage. 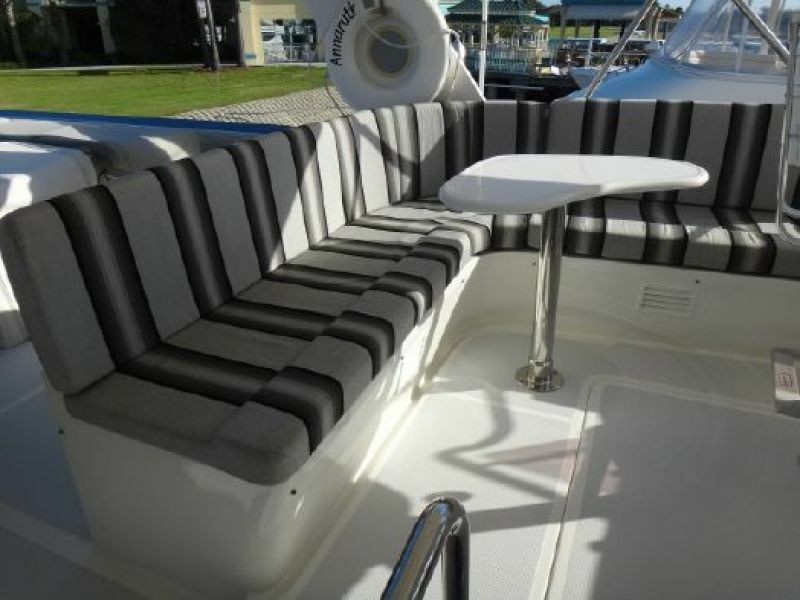 Behind each chair are storage compartments. A three‐drawer cabinet is located in the aft, starboard corner, with asmall cabinet between the chairs and an eight‐drawer cabinet forward. 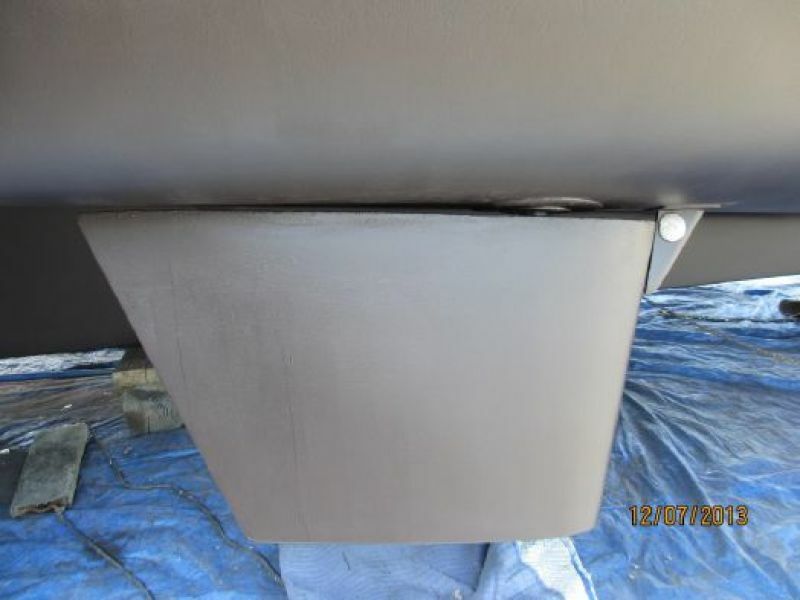 All drawers and cabinet doors are fitted with push button latches to secure them under way.• L‐shaped leather settee to port with storage underneath and behind. 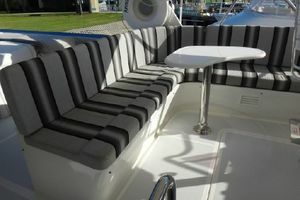 Settee is expandable tomake a berth. 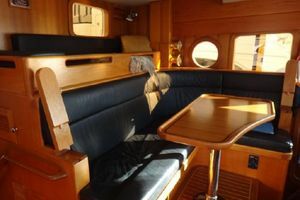 The expansion cushion is stored on the pilothouse berth.• Two leather barrel chairs to starboard with Ottomans for storage.• Locking mechanism for the lazarette under aft section of the settee.• Emergency engine battery cut‐off switches in a glass fronted cabinet under the aft portion ofthe settee.• Teak overhead grab rails.• Six large windows with screened, sliding opening and locks. 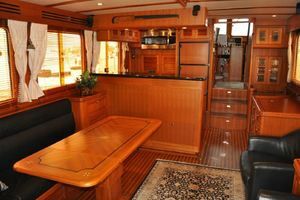 Windows are equipped withunbreakable Lexan storm shields that are stored in the lazarette in canvas pockets when notin use.• Hi‐Lo fold‐up teak table, adjustable distance from settee, and removable.• Cabinet forward of the chairs adjacent to the galley, with eight drawers• Cabinet between chairs.• Cabinet aft to starboard with glass front top compartment, three drawers and a rear compartment for fire extinguisher. 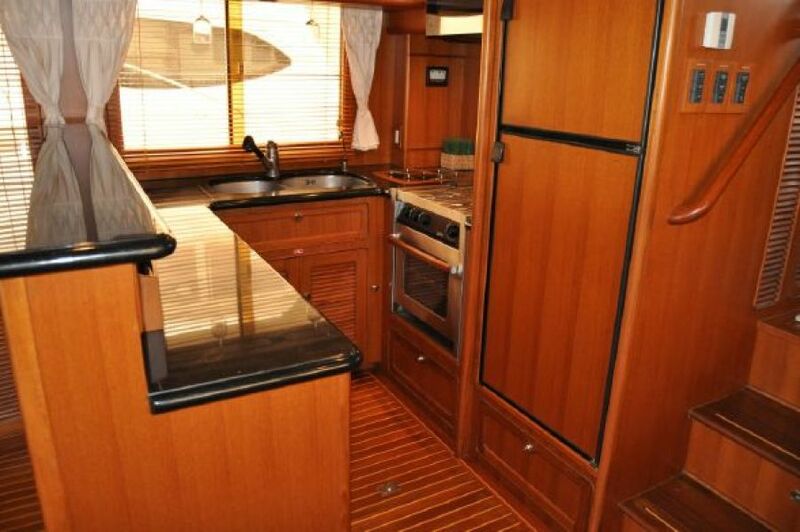 All cabinets have tops fitted with fiddles to restrain objects from slidingoff under way. 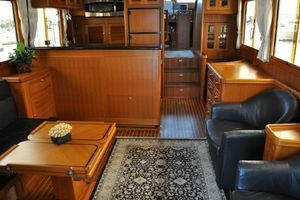 All cabinets have push button latches to secure them under way.• Port side cabinet forward of the settee with drawer and louvered cabinet door enclosing aBose Lifestyle 48 entertainment center, with four surround‐sound speakers near the ceilingand sub‐woofer under settee. 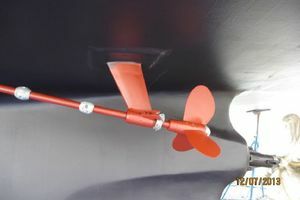 A satellite receiver connected to gyroscopic antenna on the mast would be provided by new owner's service provider. 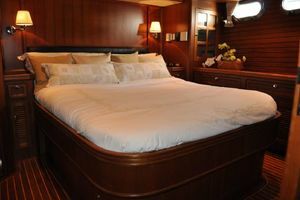 An additional DIRECTV receiver islocated in the master stateroom.• A notebook with location of all through‐hulls, safety and fire equipment is located in the drawer of the port side cabinet.• A 22‐inch LG LED, flat panel TV is mounted in a recessed closable compartment in the counterbetween the galley and salon.• A Diamond Sea Glaze Dutch door center aft is fitted with a removable screen enclosure to allow bug‐free ventilation.• Cantalupi dome lights with fore and aft sections independently dimmable.• Cantalupi LED reading lights over settee and near chairs.• Rope lights around the salon provide pleasant mood lighting.• Bamboo mini blinds on all windows• Teak and holly sole.• Emergency fuel tank cut‐offs under the forward section of the settee.• Cruisair air conditioning/ reversed cycle heating thermostat and control located in the aft portcorner.• Carbon monoxide sensor/alarm located in the aft starboard corner.• 110‐volt receptacles in the port and aft corners of the salon.• Switches for forward and aft ceiling lights, and mood light on starboard aft cabinet.• Access hatch to commissary in the sole forward of the salon door. 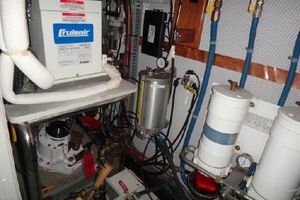 The commissary is aft of the engine room, accessed through a hatch just inside the salon door. 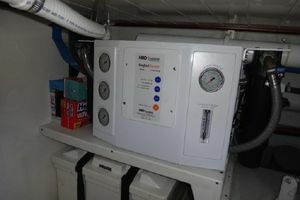 In the starboard side closet is the Magnum MS2812 2800‐watt, 110 VAC inverter and 120-amp DC charger located on the forward wall.On the back wall is the temperature control and door for the Grunert cold plate freezer with 6.5 c.f. 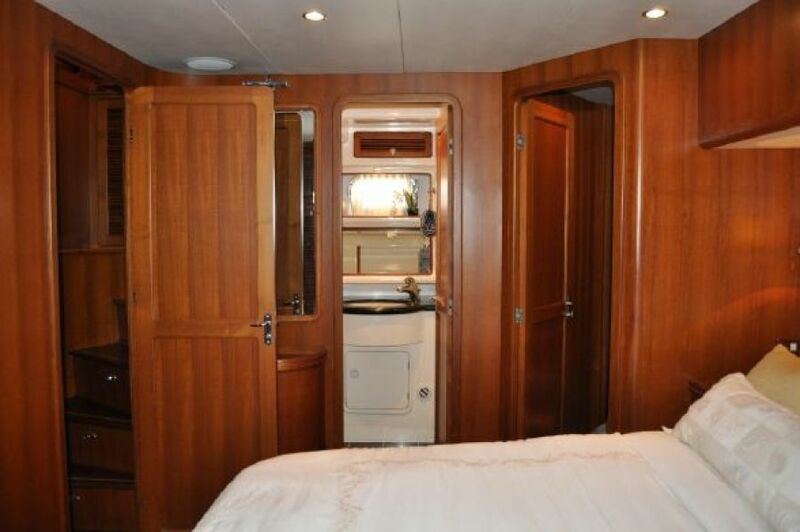 of storage, and other closets for an additional 8 c.f. 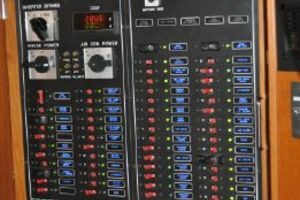 of storage. 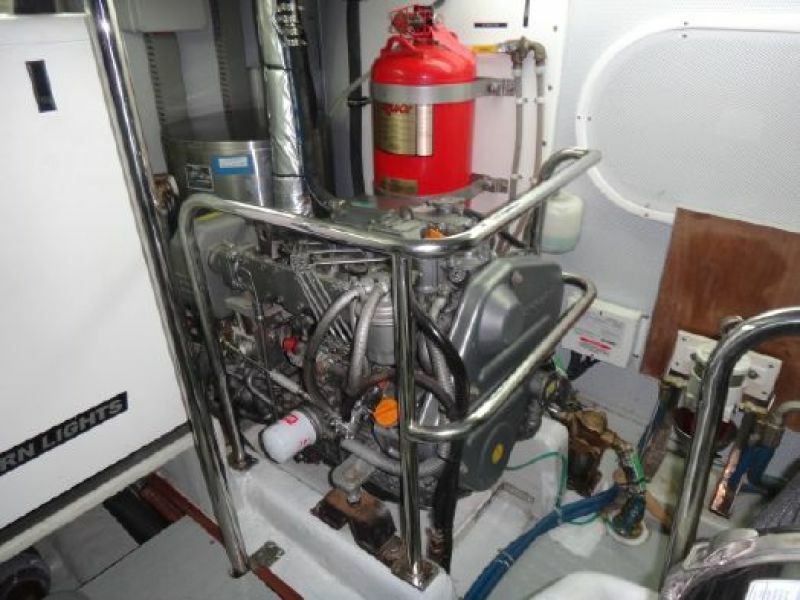 The port side closet has the muffler for the Yanmar wing engine, the manifold and valves for the Kabola heating system, and the Cruisair 3600 BTU compressor for the salon, galley, and pilothouse HVAC. From the galley area, to provide easier access to the lower level, Theodore has the optional second stair with curved hand rail and overhead handrail. 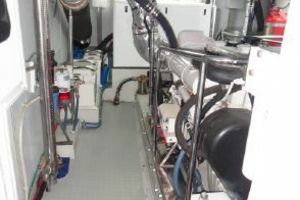 There are five steps compared to eight steps in the forward stair. 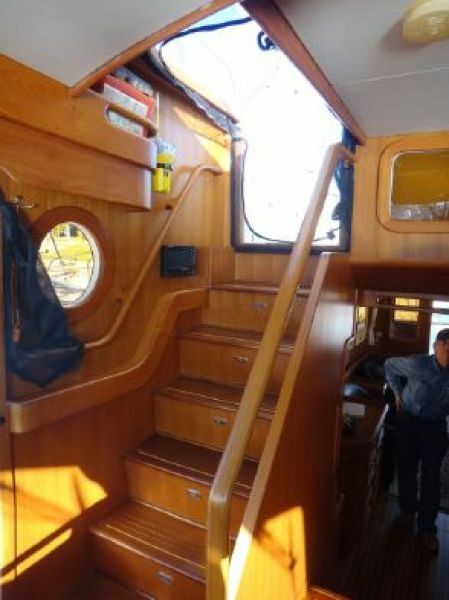 There is a cedar lined locker for hanging items on the aft wall of the stair, a small, document sized glass cabinet on the inboard wall, and a large, cedar lined locker for hanging items at the starboard side, at the foot of the stair. Above the stair is aglass fronted, two‐section lighted cabinet with a shelf with holes for bottles and a glass shelf above it. Above that is a glass‐fronted cabinet for curios or other small items. 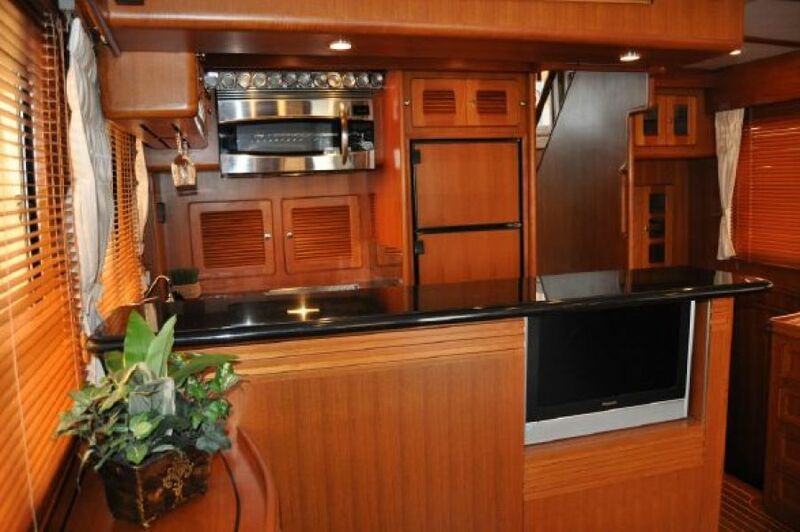 Both cabinets have lights with independent switches that can be set to turn lights on manually or automatically when cabinet doors open.A most important feature of the second stair is the ability to close a door to the master stateroom while accessing the engine room. 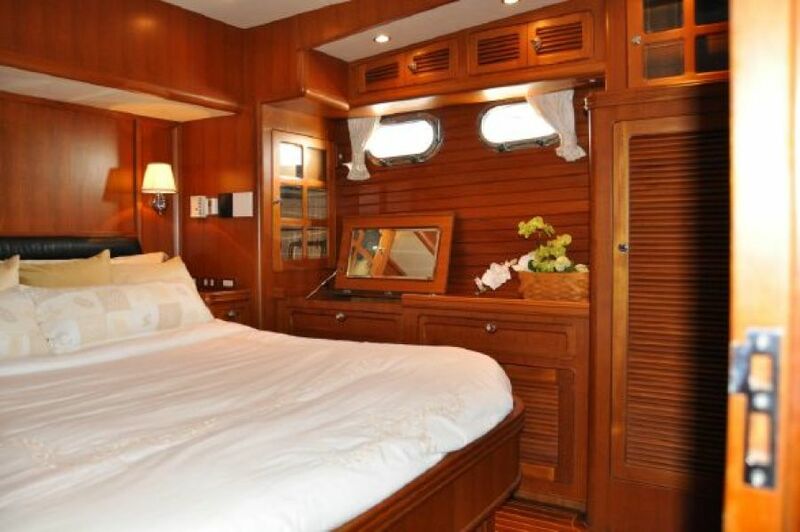 This provides privacy and an additional level of sound isolation for occupants of the master stateroom yet provides easy access to checking the engine room during long passages. 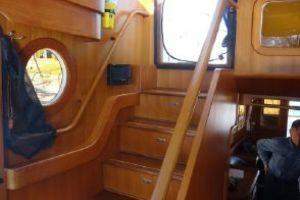 The second stair also provides additional egress from the lower level in case of emergency. The Selene 53 pilothouse is a command center of extraordinary utility and comfort. 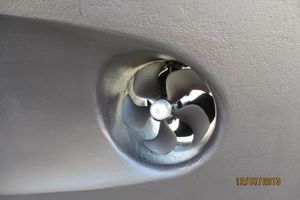 Forward raked windows provide shading and minimize glare. 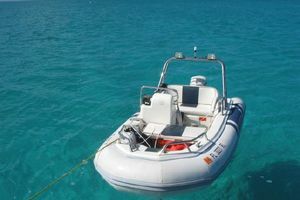 Air conditioning, heat, window defrosters, powerful windshield wipers, Diamond Sea Glaze doors, and more provide an all‐weather, secure and comfortable environment for piloting the boat. 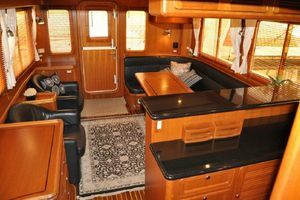 Theodore is fitted with a comprehensive suite of navigation and system equipment.• L‐shaped, black leather settee• Teak table• Raritan icemaker behind louvered door ‐ new motor 2018• Speakers for the independently controllable unit of the Bose Lifestyle 48 system are mountedin the ceiling with a dedicated wireless controller for this part of the system.• Chest of drawers near port side door, two 6‐inch‐deep drawers, one with the comprehensiveCAD drawings for the boat, and a lower file‐sized drawer with complete collection of manualsfor all equipment.• Cruisair fan control for heat exchange unit• Louvered cabinet doors below the raised area to access the air conditioner heat exchangerand storage.• Small lockers under steps to the settee.• Lockable storage cabinet behind settee.• Deep storage bin under the port side settee.• Manual remote release for the engine room fire extinguisher.• 110‐volt outlet below settee.• Outlet for Simrad remote AP27 autopilot control. 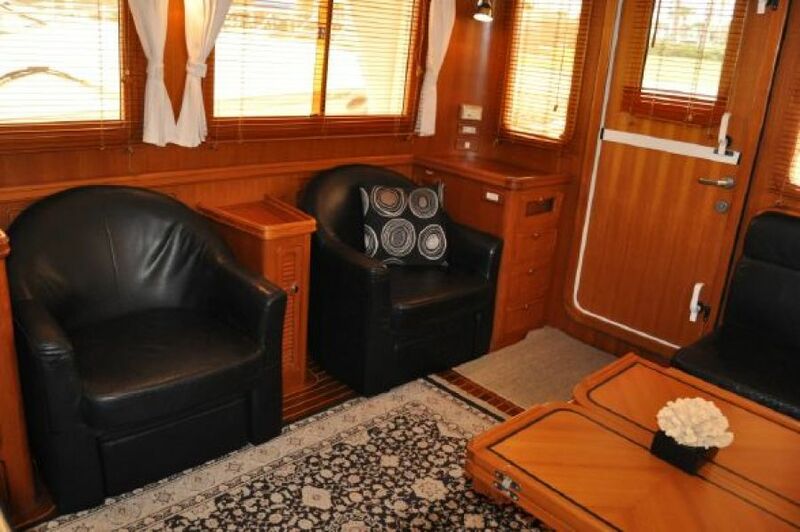 Allows driving while seated at the settee.• Cantalupi white ceiling lights.• Independent red Cantalupi lights over the console for night operations.• Diamond Sea Glaze Dutch doors.• Detachable screens for the Dutch doors and sliding hatch to the fly bridge.• Overhead clear Manship hatch with Ocean Air sliding cover and sliding screen.• Watch berth extendable to six ft behind the settee• Reading light and book rack at starboard end of the watch berth.• Teak overhead hand rails on ceiling an over stairs.• Teak rail on salon‐to‐pilothouse stairs.• Cantalupi lights on steps to pilothouse• Light switches and dimmers for salon and galley on port side wall ascending to pilothouse.• Thermostat for Kabola hydronic furnace on wall adjacent to switches.• Doors to the cabinet above the refrigerator high on port side of stair well.• Tall cabinet next to icemaker. 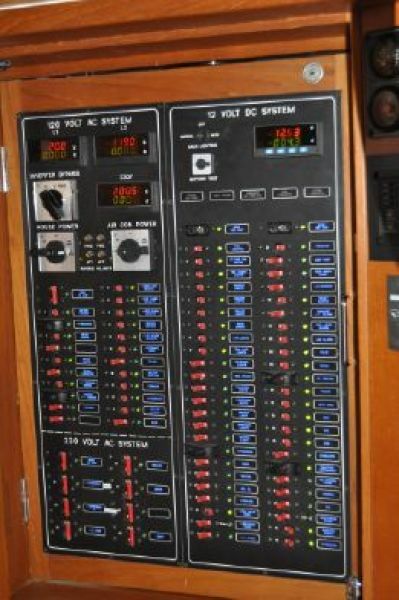 • A counter area to port with 110‐volt outlet, phone jack for the Charles Systemtelephone/intercom system and serial port allowing a laptop computer to access GPSinformation and control the autopilot.• A glass‐fronted door at the far port side, below the counter encloses the master housebattery switch, forward holding tank level indicator, and switches to manually orautomatically control all bilge pumps.• Controls for turning on, aiming and focusing the Francis spotlight are located on theright panel.• The Yanmar wing engine start and stop switch and display are located on the right panel.• The Cummins SmartCraft display for the main engine is located on the right side consolepanel.• Main engine ignition and start switches are located forward of the Glendinning control.• Forward and aft thruster controls are to right of Glendinning control.• The main engine electronic Glendinning control is mounted right of center on the console.• Hynautic throttle and gear box controls for the Yanmar wing engine are mounted left ofcenter on the console.• There is a Professional Mariner Zinc Saver II, 50 Amp galvanic isolator mounted in the cabinetunder the console.• There is a Digital Antenna cell phone amplifier mounted in the cabinet under the console.• Console switches include: heater/defroster fan, control for ACR spotlight, switch for theMaxwell 2200 windlass allowing lowering and raising the anchor, controls for the Exaltowipers, switches for horn, fly bridge light and panel lights, switch for Sea Me active radarreflector, analog rudder position meter, switches for Nobeltec radar, selection of videocamera, remote switch for navigation computer and Xantrex charge managing switches.• A graphic display of the boat with lights showing electrical activity for lights and bilge pumpsare on the port side aft‐facing, overhead panel as is a panel showing the condition of theengine room fire suppression system.• The controls for NAIAD 254 stabilizer are mounted on the side overhead panel facing inward.• An Echo pilot FLS‐II forward looking sonar display is mounted at the port side of the overheadpanel.• Simrad IS15 instruments include two Multi displays and a Wind display above the console, aMulti display on the fly bridge, and a Combi display in the master stateroom. 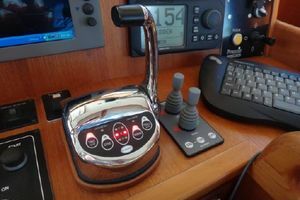 The Simradsystem has a dedicated GPS.• An Icom 802 SSB is mounted on the inward face of the starboard overhead.• Simrad AI80 class A AIS interfaced to the HP Navigation w/Time Zero computer/chart plotter.The AI80 has a dedicated, backup GPS, and dedicated VHF antenna.The display and controlare mounted at the starboard end of the overhead panel.• A remote command microphone connected to the flybridge Icom 602 VHF radio is mountednear port side door. 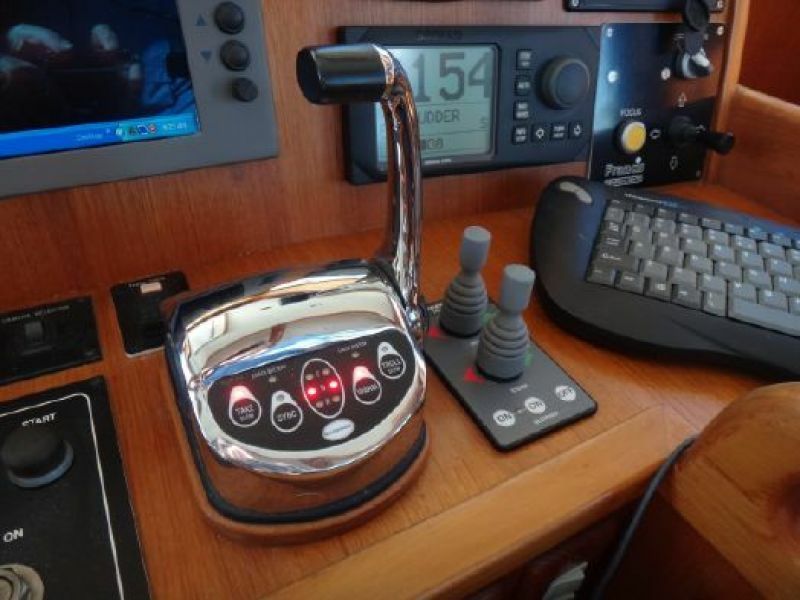 All remote microphones replaced new 2017.• A Furuno Model SC50 satellite compass provides Lat/Lon, and heading data for the entirenavigation system. 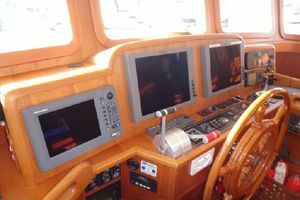 The display is on the port side facia above the window.• A 5‐inch Richie compass with cover is mounted on a pedestal on top of the console.• Simrad AP25 autopilot with two redundant fully connected rudder control pumps.The AP25receives waypoint and navigation information from Nobeltec Admiral software on thenavigation computer or from the Furuno chart plotter. 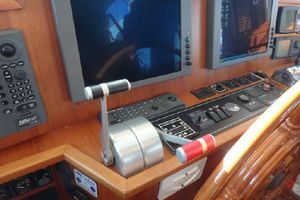 A laptop computer with navigationsoftware can also be used.• The AP25 receives location and heading data from either a dedicated Simrad Magnifluxcompass or from a Furuno SC 50 satellite compass networked to the navigation computer.• Simrad AP27 full function remote control that can be plugged in to receptacles below thepilothouse settee, in the forward Portuguese bridge or the portside locker in the cockpit.• The AP25 receives location and heading data from either a dedicated Simrad Magnifluxcompass or from a Furuno SC50 satellite compass networked to the nav computer.• Simrad AP25 autopilot with two fully connected and redundant rudder control pumps. 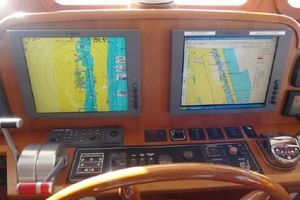 TheAP25 receives waypoint information from the Nobeltec Time Zero (2018) software on the navcomputer or from the Furuno chart plotter. 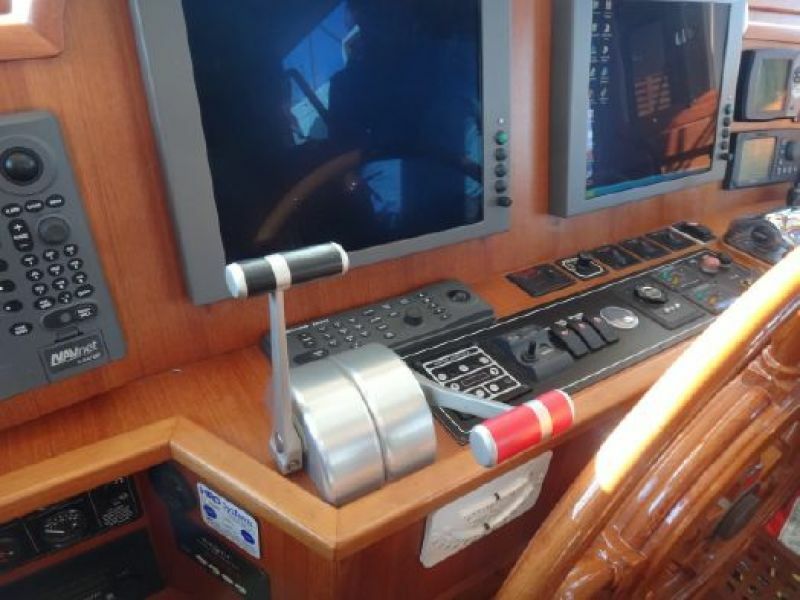 A laptop computer with nav software can also beused.• HP solid state drive navigation computer with Nobeltec Time Zero nav software installed. 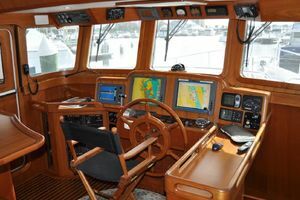 Itincludes comprehensive charts for the East Coast of US and Bahamas• Nobeltec 48‐inch open array radar with MARPA target tracking is integrated with the system.The computer is controllable by wireless keyboard, wireless pointing device, or wired orwireless mouse.• Also installed is software to display video from two cameras in the engine room and an aft‐facing camera in the cockpit.• The navigation computer displays to a dedicated Big Bay, 17‐inch, daylight visible display withfully dimmable control to adjust brightness for daylight or night lighting.Replicated onbridge on 14" Big Bay display.• Furuno model GD1900C‐BB black box chart plotter displaying to a second dedicated Big Bay17‐inch display. 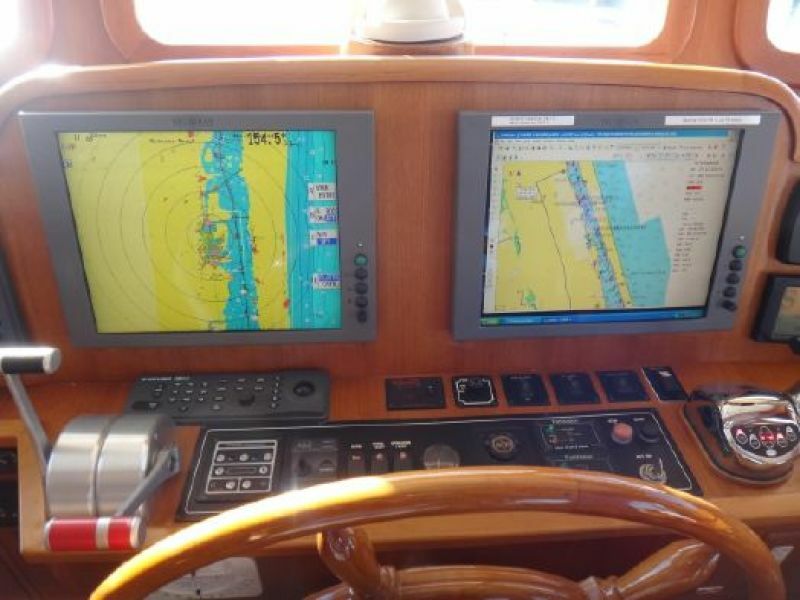 The Furuno system has a 48‐inch open array radar with MARPA hardware fortarget tracking. 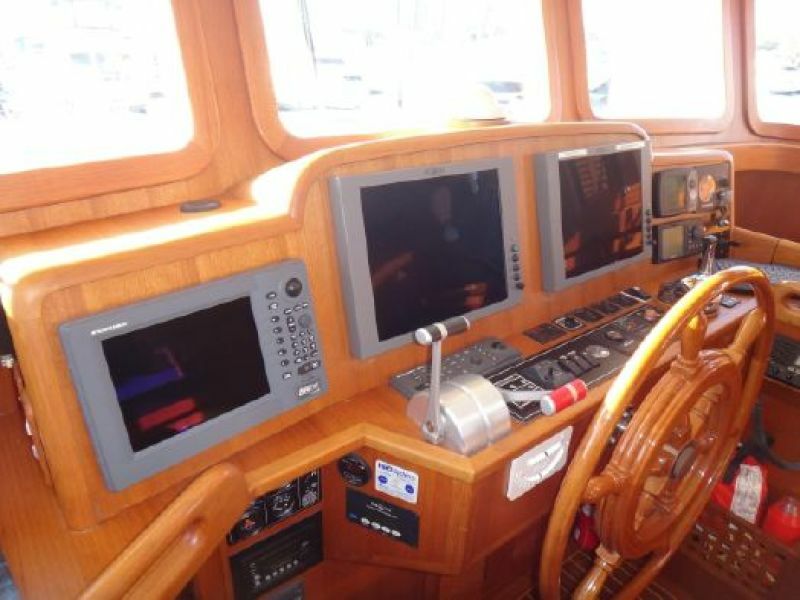 Keyboard is on the console.• Furuno GD1900C 10‐inch integrated display with remote control.• The Furuno system includes a dedicated GPS and depth sounder/fish finder.• Zinc saver under console• A large glass fronted door encloses the master electrical panel with circuit breakers for theentire electrical system.• To the right of the main panel are located the displays and controls for the Sea Tel satellitetelevision receiver, the Magnum inverter, the HRO watermaker, the house batterymonitoring system, circuit breaker for the Maxwell 2200 anchor windlass and an inclinometerto display the roll level of the boat.• A center‐line, hand‐crafted teak wheel manually operates the Hynautic rudder steeringsystem.• A unique, remote engine/gearbox/rudder/thruster control that can be quickly mounted atfour different forward and aft positions on both sides and connected to the boat controlsystems by a 25 ft control cable.• Remote wireless, hand held controller for the Side‐Power thrusters. 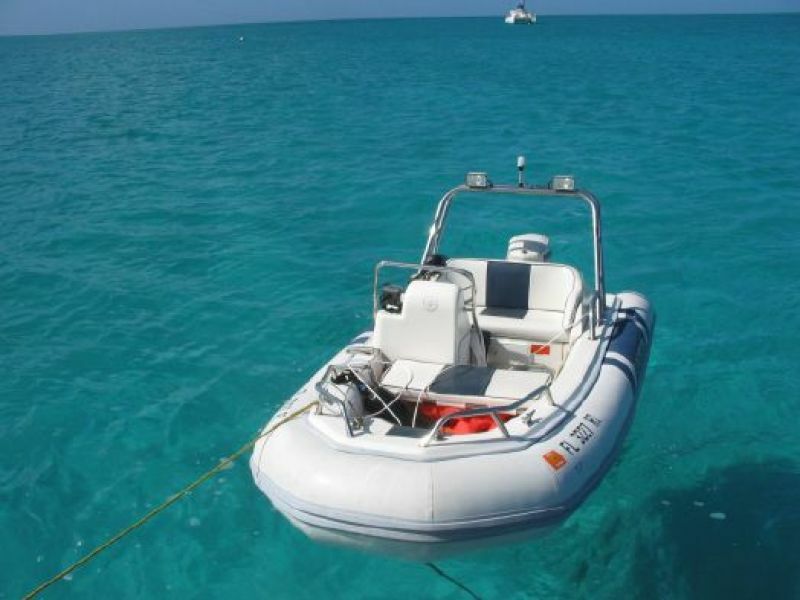 Very useful for adjustinglines and egress to the swim platform while on the dock. Just forward of the master stateroom door on the port side is the Bosch vented dryer. 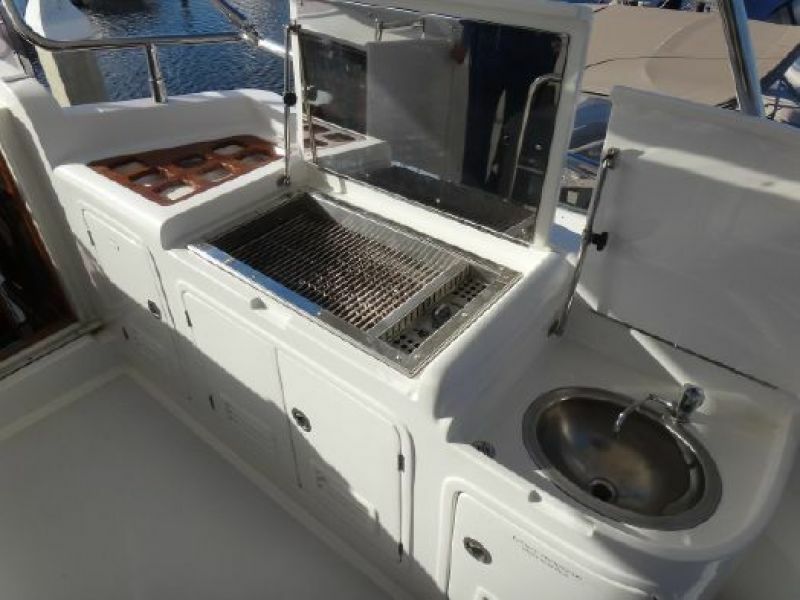 The Bosch washer is located at the halfway landing of the stair to the pilothouse. 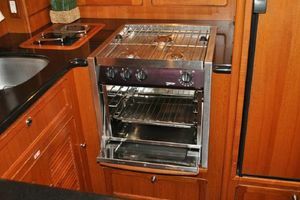 Both washer and dryer have louvered, cabinet doors to conceal them when not in use. 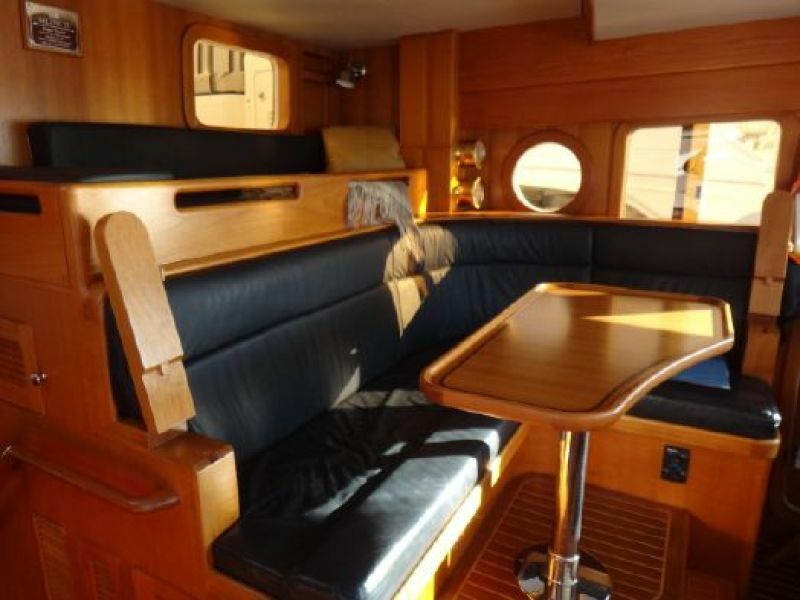 • Varnished teak mast mounted on the bowsprit rail for the owner's burgee or• Varnished teak mast mounted on the bowsprit rail for the owner's burgee or other signals• Genuine Bruce 110 lb. 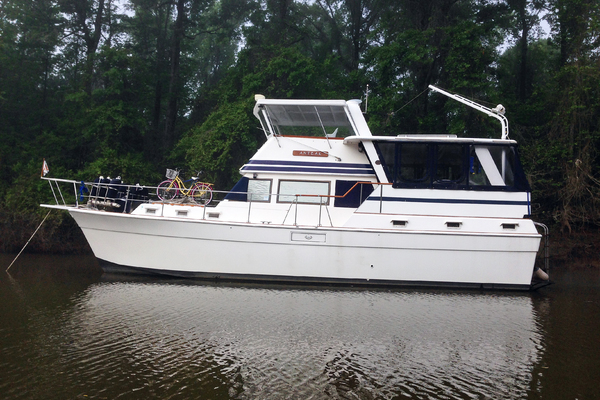 anchor on the starboard side and an 88 lb. Delta anchor on the portside of the bowsprit• Each anchor fitted with 400 ft of 3/8 inch steel chain connected to the anchor by a clevis andswivel link• Cable lock downs for each anchor while under way• Raw water, and a fresh water faucet for washing down the anchors• Forward 50A, two 30A and cable/telephone Marinco receptacles with covers• Foot switches for lowering and raising an anchor• Large stainless‐steel Samson post• Stainless cleats in recessed hawse holes both sides• Scuppers both sides• Deck drains both sides• Dock boxes for storage of lines and other gear on the port and starboard sides• Seat with cushions centrally in the forward side of the Portuguese bridge• Door to the foredeck near the starboard side of the Portuguese bridge• Lockable cabinets in the Portuguese bridge. 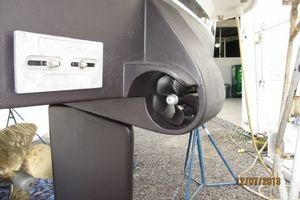 • Mounts for remote engine/gearbox/rudder/thruster controls or downriggers at the port andstarboard inside corners of the Portuguese bridge and cockpit• Electrical connections for the remote controls inside the center cabinet• High side door located on the starboard side opposite the pilothouse door• Eight special fixtures for adjustable hanging of fenders located along the sides below the caprail• Recessed hawse holes and stainless cleats for attaching lines• Overhead fishing rod holder on port side deck ceiling aft• Lighted steps from pilothouse level to cockpit level• All overhead lights changed to LED• Drains at forward end of lower side deck and aft corners of the cockpit.• Video camera mounted on the ceiling looking aft can be displayed on the main navigationcomputer display.• Mounts for remote engine/gearbox/rudder/thruster controls or down-riggers at the port andstarboard inside corners of the Portuguese bridge and cockpit• Electrical connections for the remote controls inside the center cabinet• High side door located on the starboard side opposite the pilothouse door• Eight special fixtures for adjustable hanging of fenders located along the sides below the caprail• Recessed hawse holes and stainless cleats for attaching lines• Overhead fishing rod holder on port side deck ceiling aft• Lighted steps from pilothouse level to cockpit level• All overhead lights changed to LED• Drains at forward end of lower side deck and aft corners of the cockpit.• Video camera mounted on the ceiling looking aft can be displayed on the main navigationcomputer display.